Community Canine - Establishment Dog Training, Ltd.
As the result of many Evaluators requesting an advanced AKC Canine Good Citizen title, the AKC has announced the creation of the AKC Community Canine title (CGCA) in October of 2013. The AKC believes that the CGCA expands the CGC skills and lays the foundation for obedience, rally and therapy dog work. While CGC test are simulations of real world skills, the goal of the CGCA program is to test the dog's ability in a natural setting. For example, rather than the test being administered in a show ring, certain elements will involve a dog walking through a real crowd. Whether at a dog show, training facility or on a busy sidewalk in the community. As with the CGC, the AKC Community Canine requires a ten step test that the dog must pass to earn the official AKC Community Canine title which is designed to recognize dogs that have good manners in the home and in the community. The American Kennel Clubs S.T.A.R. Puppy, Canine Good Citizen and Community Canine Programs provide an excellent foundation for training in other fun activities such as rally, obedience and ability and results in a well mannered dog. All dogs that pass the 10 step CGCA test will receive a certificate from the American Kennel Club. If your purebred or mix-breed dog has an AKC, PAL or Canine Companion registration number, the CGCA Title will be added to your dog's registered name. Our trainer is a Certified Canine Good Citizen Evaluator. 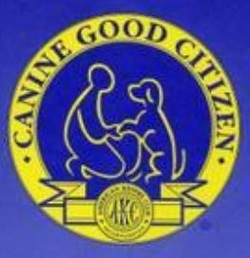 Our Canine Good Citizen classroom course will teach the skills required to pass the Community Canine Test. Graduation exercises for this class will be conducted in the form of a Canine Good Citizens test. If the dog and the handler passes the test, the Trainer will award them a qualifying score and the AKC paperwork which will allow them to apply for the Community Canine Certificate from the American Kennel Club.